I can officially do anything. This is the exact thought that ran through my mind as I pulled my perfectly roasted 16-pound turkey out of the oven today. Of course I’m exaggerating slightly—I don’t think that I can solve poverty in India, or bring peace between North and South Korea (or North Korea and the rest of the world for that matter) but in terms of the culinary world, I have conquered my biggest fear and feel ready to take on any challenge. I decided to take on the daunting task of cooking “the bird” because I simply got too impatient to wait another week for thanksgiving food. Once Starbucks starts playing Christmas music and Sarah Lee pumpkin pies hit the shelves at the supermarkets, my internal clock starts counting down for turkey and stuffing. So I sent out a facebook message to 13 of my girlfriends inviting them over for a potluck style thanksgiving meal before we all went home for break. I had each of them sign up to bring a side dish and agreed to make the turkey, gravy, mashed potatoes, and stuffing myself. Obviously, everyone was down for this epic feast and so the night before the dinner I found myself face-to-face with an enormous 16 pound turkey. (For the first time ever, I actually asked for assistance to my vehicle at the supermarket). I put “the bird” in the sink, took off the plastic wrap, and then just stared at it in sheer panic…I didn’t even know where to begin. So naturally, I got on the phone and called my mom. She walked me through removing the giblets (reminiscent of my 7th grade frog dissection) and then told me to stuff it with whatever herbs and veggies I wanted. She recommended not to do stuffing as that greatly increases the cook time (especially for a turkey as big as mine) and also because it can cause a health issue if the stuffing absorbs any bacteria from the raw turkey meat. So I kept it simple and stuffed my turkey with sage, rosemary, Spanish onion, garlic, celery, and lemon. Then I made a nice lemon herb butter to drizzle on top so that the outside would get golden and crispy (recipe follows). I tied the legs together with some twine, brushed on the butter sauce, and covered it in foil before putting it in the fridge for the night. Now I love Ariana to death, so I couldn’t get mad at her, but you can only imagine how fast I ran home from work. I just kept imagining my turkey black and smoking, completely inedible, and the chance of my apartment burning down. Well when I finally got home and saw my oven smoking, I thought the worst of my fears were a reality, but I managed to salvage the situation. I took the turkey out, scraped off the top burnt layer, recovered it in foil, and then put it back in on a lower heat. I let it keep cooking until 6:30, and then took off the foil and let it cook for another 30 minutes uncovered. When I pulled it out of the oven at 7 O’clock, it miraculously looked picture perfect. I couldn’t even believe it. I then let it sit for an hour and a half (covered) on the counter while I cooked the rest of my side dishes. Now they say not to judge a book by its cover, so I didn’t have my hopes up yet (even though it looked pretty incredible). But when I popped a little piece of that warm turkey into my mouth, I was amazed that it tasted even better than it looked. I couldn’t have asked for a better first turkey experience!! And I couldn’t have asked for any greater people to share it with either. I am proud to say that we ate all of the turkey with the exception of maybe ½ pound of meat…which I happily ate the following day for lunch. Remove the giblets from the turkey and wash the turkey inside and out, patting dry when finished. Place the turkey in a large roasting pan and then liberally salt and pepper the inside of the turkey cavity. 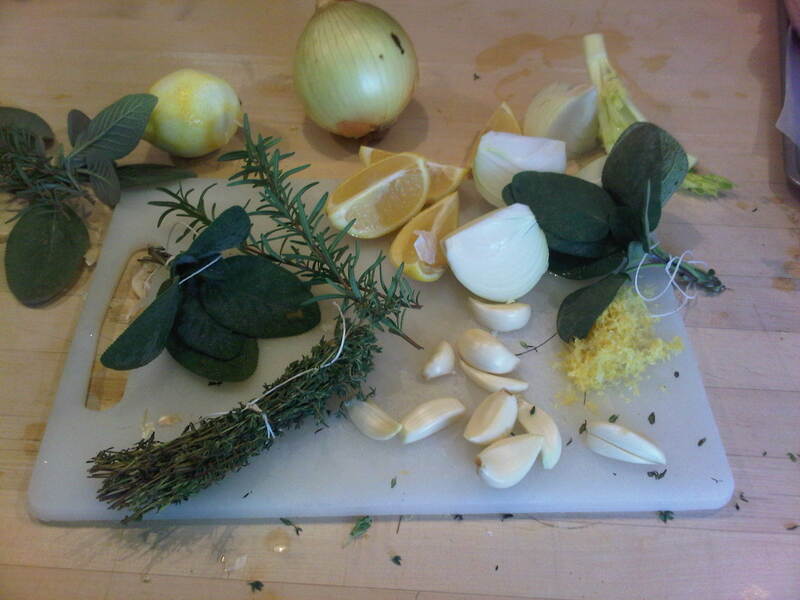 Stuff the cavity with the bunches of thyme, rosemary, and sage, the quartered lemon, celery, quartered onion, and the garlic cloves. Brush the outside of the turkey with the butter mixture (recipe below) and sprinkle with salt and pepper. 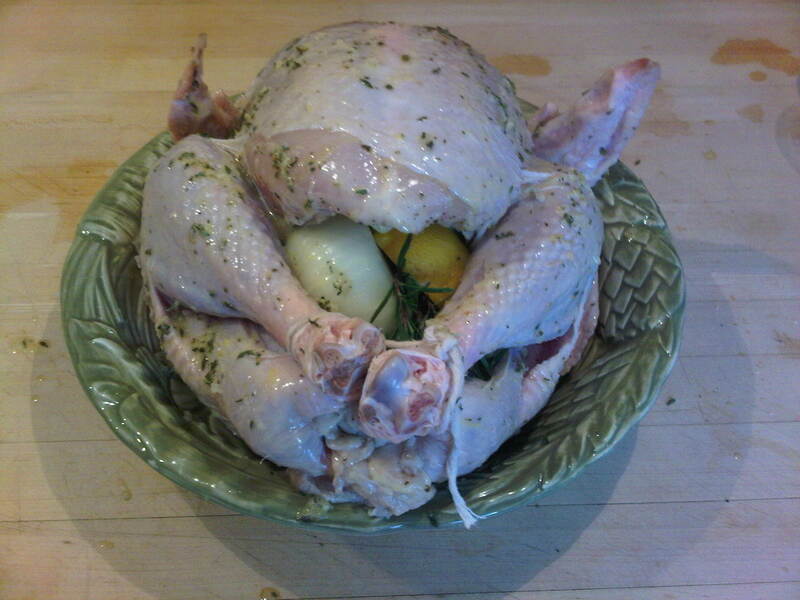 Tie the legs together with string and tuck the wing tips under the body of the turkey. Roast the turkey about 21 minutes per pound of meat, or until the juices run clear when you cut between the leg and the thigh. I liked letting mine cook for the last 30 minutes uncovered so that the outside browned and crisped up. Remove the turkey from the oven and cover with aluminum foil, let stand for at least 30 minutes, or up till serving time. (Hint: the longer the turkey sits, the more the flavors develop and the juicier it is….but don’t let it sit at room temperature too long or bacteria can develop). 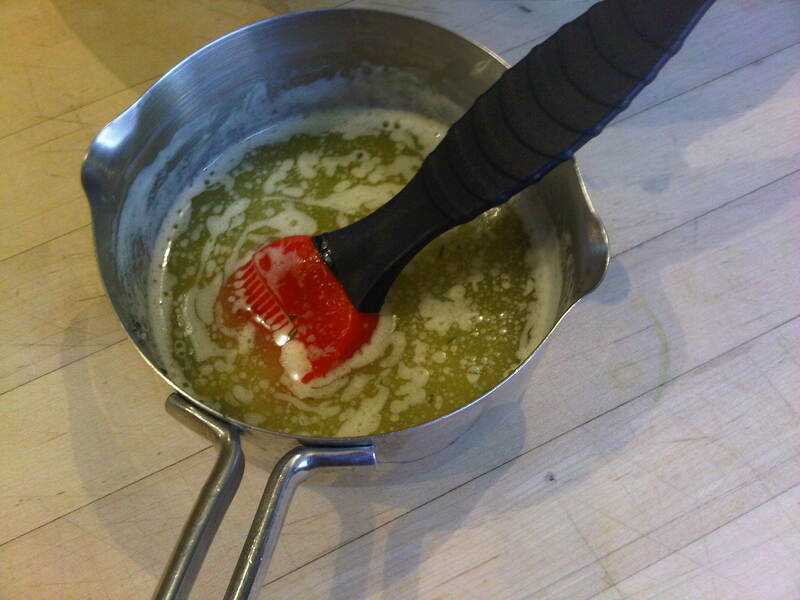 In a medium sauce pan, melt the stick of butter. Then whisk in the zest and juice of one lemon and the chopped thyme leaves. Remove from heat and brush on turkey. I make chicken this way regularly (stuffed with lemon and celery etc). 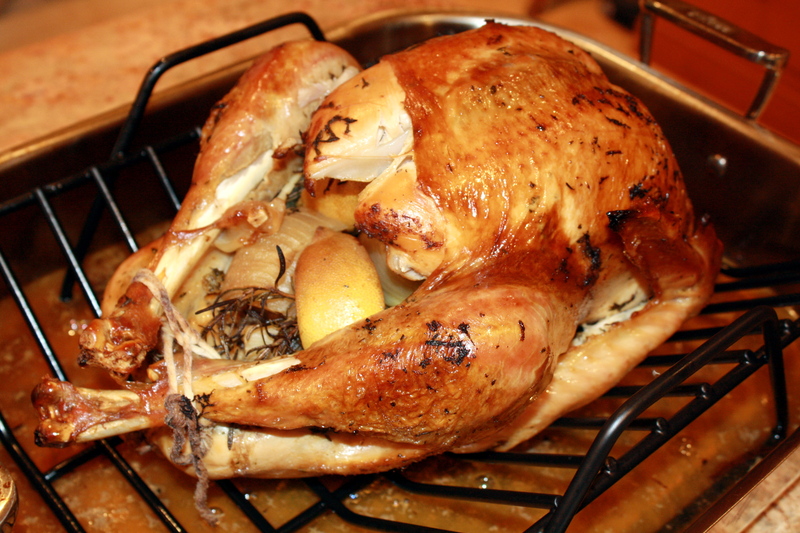 Never tried the butter-lemon basting though…. sounds and looks great! I have made this classic herb-roasted turkey for the past three years, and I have never been disappointed with the outcome! Forget the complications of brining your bird, and keep it simple with this herb-roasted and citrus infused, roasted turkey recipe.